Friday 4th May, a significant day at the Liebherr 2018 World Team Table Tennis Championships in Halmstad, Sweden with a historic moment and host nation joy taking the spotlight on day six. 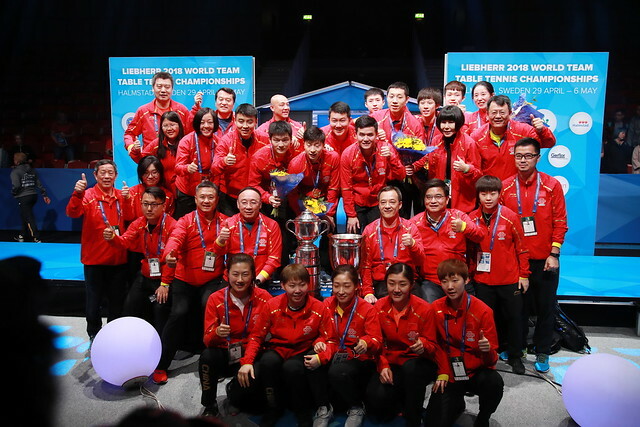 Day six featured a significant moment in table tennis history as the Unified Korea side took to the stage for the first time since in 27 years, but the team’s ambitions of making the final were dashed by second seeds Japan in the penultimate round of the 2018 event. Mima Ito handed Japan the perfect start to the tie with a straight games victory over Jeon Jihee (11-2, 11-8, 11-9) before Kasumi Ishikawa doubled the advantage, defeating Kim Song I in an emotional seven game thriller (11-4, 6-11, 11-8, 11-13, 16-14). Stepping up to compete the job was Miu Hirano, who accounted for Yang Haeun (11-4, 11-5, 9-11, 11-6) to send Japan through to the gold medal match. It will come as little surprise to see that China is the team awaiting Japan in the final but it wasn’t all plain sailing for the defending champions with Hong Kong putting up a brave fight in the last four. The proceedings began with a major shock as Ding Ning fell at the hands of Soo Wai Yam Minnie (6-11, 7-11, 6-11) as Hong Kong raced into an unexpected early lead but China soon recovered through Zhu Yuling, who held off a promising effort from Doo Hoi Kem (11-9, 9-11, 11-5, 7-11, 11-8). Liu Shiwen and Ding Ning then contributed victories over Lee Ho Ching (11-9, 11-6, 9-11, 11-4) and Doo Hoi Kem (11-8, 9-11, 11-7, 11-8) to bring the tie to a close. There were scenes of celebration for the home fans to enjoy in the quarter-finals of the Men’s Championship Division as Team Sweden stormed to a powerful 3-0 win on day six, ending England’s dreams of securing another podium finish in the process. Starting the match in style, Kristian Karlsson put the hosts ahead with a comfortable win against Paul Drinkhall (11-9, 11-8, 11-8) with Mattias Karlsson and Jon Persson adding victories over Liam Pitchford (12-14, 11-6, 5-11, 11-7, 11-9) and Sam Walker (11-8, 11-3, 14-12) to seal Sweden’s place in the last four. The big surprise of the round saw 2016 runners up Japan fail to reach the medal positions: Jeoung Youngsik put in a standout display for opponents Korea Republic, earning impressive results against Tomokazu Harimoto (17-15, 6-11, 9-11, 11-3, 11-9) and Jun Mizutani (11-5, 11-8, 11-7). Jang Woojin then came up with a superb display against Kenta Matsudaira (11-9, 9-11, 11-9, 11-7) as Korea prevailed 3-1. Ma Long had a close brush with defeat but recovered to beat Robert Gardos (11-13, 11-5, 9-11, 11-7, 11-3) as China triumphed by a 3-0 score-line in its encounter with Austria while the other spot in the semi-finals was awarded to top seeds Germany following their successfully 3-1 outing against Brazil.